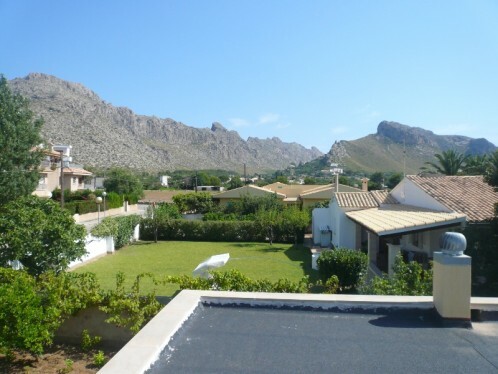 In the area of Siller you can find this villa of a 1.500m2 plot. In the first floor the house offer a completely separated apartment with 3 bedrooms, a fitted kitchen and a complete bathroom. From the sunny terrace (about 40m2) you have beautiful views over the mountains. Air-condition (hot_cold). On the ground floor the house has 3 double bedrooms, another complete bathroom, a fitted kitchen and a big living dining area with chimney, a lot of light and an access to the terrace. Part of the property is as well a big garage for two cars with a shower room and another separated apartment. In the garden you can find fruit trees, tomatoes and a lot of potential to create a nice garden area with a plunge pool or an extra terrace. With a bit of work this property could be the perfect house for a family of two generations or a house with the possibility to rent the apartment in the first floor out.